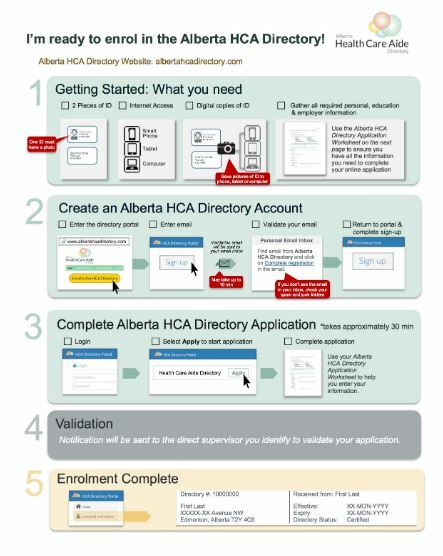 Here are some common questions that you may have about the Alberta Health Care Aide Directory. Are HCAs Required to Enrol in the Directory? Alberta Health has mandated that all Health Care Aides (HCAs) working for a publicly funded employer enrol in the Alberta HCA Directory. If a HCA works for a privately funded employer, they are able to enrol in the Directory and are encouraged to do so. Having all HCAs working for a publicly funded employers enrol in the Directory will provide Alberta Health and its partners with good workforce data, which will support the development of health human resource plans. More importantly, it will provide public assurance that Alberta’s HCAs are competent. Notify contracted operators of these requirements and conditions. Wasn’t there already a Directory in place? 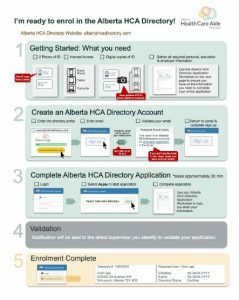 Although there was a 2011 version of a HCA directory, this Directory has been implemented to accommodate all HCAs in Alberta, their employers and educators. The old version required employers to report their HCA employees, but the new version gives HCAs the ability to enrol themselves. It also acts as a database and provides aggregate information applicable to each stakeholder group, including government, employers, HCAs, and educators. Can educators enrol HCA students once they graduate? Health Care Aides will have the ability to enrol themselves on the Directory once they have been accept in an approved HCA Certificate Program in an Alberta approved HCA educational institution. Once the HCA successfully completes the program, it will be necessary to provide proof of course completion directly from the post-secondary institution to the Alberta HCA Directory. What status will students enroled in an approved HCA program be given while their status is being confirmed? An HCA’s status will remain Certified-In-Progress until their official transcripts are received and confirmed by the Directory. Is it possible to advertise on the Directory? The Directory will post educational and employment information relevant for HCAs on the website. Contact us at info@albertahcadirectory.com to discuss. Without a certificate from an approved Alberta educational institution, Alberta employers can review a potential employee’s education to determine if it is substantially equivalent, which means equal to the standards of education of HCAs upheld in Alberta. If the HCA is internationally educated, some employers may assess previous education and may accept education as substantially equivalent to the Alberta competency profile and curriculum. Or, the employer may hire the HCA and conduct a competency assessment. If the HCAs education does not prove to be substantially equivalent, they may become a certified HCA by successfully finishing a formal Health Care Aide program approved by the Government of Alberta. Can I enrol with the Directory if I am an Alberta trained HCA that is currently unemployed? If you were educated from a recognized institution in Alberta and living in Alberta, you can enrol. This opportunity gives unemployed HCAs who have appropriate documentation verifying their certification, to be recognized as part of the HCA service provider group. Is there a fee to enrol in the Directory? There is no fee to enrol in the Directory. Does the Alberta HCA Directory act as a regulatory body for HCAs? The Alberta HCA Directory is not a regulatory body under the Health Professions Act. It is a database containing information about HCAs. HCAs remain unregulated care providers who must be supervised by a regulated professional.